Oxford University Press, USA, 9780198844419, 320pp. Philosophers and poets in times past tried to figure out why the stainless moon "smoothly polished, like a diamond" in Dante's words, had stains. The agreed solution was that, like a mirror, it reflected the imperfect Earth. Today we smile, but it was a clever way to understand the Moon in a manner that was consistent with the beliefs of their age. The Moon is no longer the "in" thing. We see it as often as the Sun and give it little thought ED we've become indifferent. However, the Moon does reflect more than just sunlight. The Moon, or more precisely the nomenclature of lunar craters, still holds up a mirror to an important aspect of human history. Of the 1586 craters that have been named honoring philosophers and scientists, only 28 honor a woman. 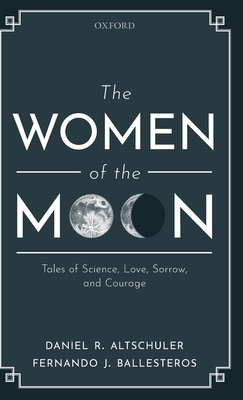 These 28 women of the Moon present us with an opportunity to meditate on this gap, but perhaps more significantly, they offer us an opportunity to talk about their lives, mostly unknown today. Daniel R. Altschuler, Full Professor, Physics Department, University of Puerto Rico, RIo Piedras CampusFernando J. Ballesteros, Head of instrumentation, Astronomical Observatory of the University of Valencia Daniel Altschuler Stern is a professor in the Physics Department of the University of Puerto Rico, Rio Piedras Campus. In 1991, he was appointed Senior Research Associate at Cornell University and Director of the Arecibo Observatory, a post he held for 13 years. He is also a Visiting Research Fellow at the Max Planck institute for Radio Astronomy, and a UNESCO fellow at the University of Valencia. His research centered on radio astronomy, in particular on active galactic nuclei and hydrogen in galaxies. In 2010, he received the Andrew Gemant Award from the American Institute of Physics (AIP) for his science outreach work. Altschuler Stern is the author of Children of the Stars, published by Cambridge University Press and translated into Spanish and Italian. His latest book is Contra la Simpleza, Sciencia y Pseudociencia. Fernando Ballesteros Rosello is Head of Instrumentation at the Astronomical Observatory of the University of Valencia. He worked on the design of the gamma-ray space telescope INTEGRAL (ESA), in orbit around the earth. Currently his research centers on astrobiology and exoplanets. In 2006 he was awarded the European Prize for Scientific Outreach, Estudi General, for his book E.T. Talk: How Will We Communicate with Intelligent Life on Other Worlds? and the Bronze Prism award in 2016 for his book, Fractales y caos. La aventura de la complejidad. He is the author of over ten other books, including: Astrobiologia, un puente entre el Big Bang y la vida and 10.000 anos mirando estrellas. He was co-host of the Spanish National Radio program "The Sounds of Science" and regularly publishes science outreach articles in the press.